As a child, Laura Ingalls Wilder traveled across the prairie in a covered wagon. Her daughter, Rose, thought those stories might make a good book, and the two created the beloved Little House series. Sara Breedlove, the daughter of former slaves, wanted everything to be different for her own daughter, A'Lelia. Together they built a million-dollar beauty empire for women of color. Marie Curie became the first person in history to win two Nobel prizes in science. Inspired by her mother, Irène too became a scientist and Nobel prize winner. Borrowed Names is a very unique book in many ways. First it is written in verse. I loved that. Many of my students have learned that they like books written in verse. 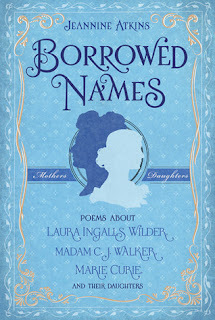 There are three biographies of three women and their children. The first is of Laura Ingalls Wilder and her daughter. The second is Madam C.J. Walker and her daughter A’Lelia Walker. Finally we learn about Marie Curie and her daughter Irene Joliet-Curie. Each of these biographies shoes how their relationships with their daughters were formed and developed over time. I found in all three, there was usually one particular thing that drew them together. They inspired each other in so many ways. I loved learning so much about all of them and will definitely recommend this book to my students.